Her food always looks delicious, but I think this is the first recipe of hers I have actually tried? Have you ever had butterscotch and peanut butter together? What a combination! So so good. Have you ever had Scotcharoos - the peanut butter flavored rice krispies with chocolate and butterscotch topping? Well, similar flavors, minus the chocolate. I knew I loved that combo, so I knew I would love these. I made these one weekend, devoured them and then made them again for work. They are rich and chewy and it is hard to stop at just one. Have you tried any of Trisha Yearwood's recipes? Which ones are your favorite? P.S. Trisha, you were rocking that red shirt the other day! Preheat oven to 350 degrees. Spray a 9x13x2-inch pan with cooking spray. Cream together butter, sugar, brown sugar and peanut butter until very light and fluffy. Mix in the egg and vanilla. Add the baking soda, salt, flour and oats and mix until combined. Press dough evenly into prepared pan. It will be very sticky and might not look like enough to fill the entire pan, but it will. Sprinkle butterscotch chips over the top. Bake for 20 minutes. Remove from oven and top with peanut butter icing. Allow to cool. Cut into squares and serve. For the Peanut Butter Icing: Combine all ingredients and stir together until smooth and creamy. If mixture is too thick, add a little more milk. 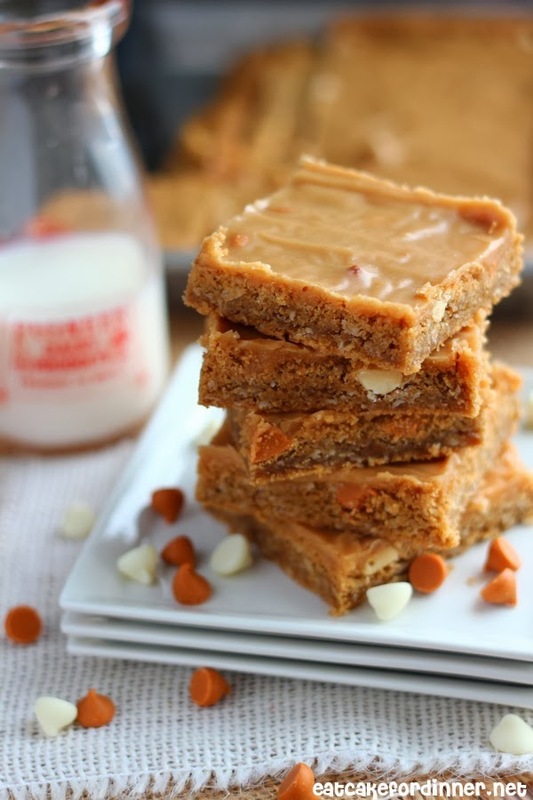 Spread over warm peanut butter bars. I've never thought of combining butterscotch and peanut butter without the chocolate! These look so good! Wow! Definitely pinning this recipe for later. I don't think I could find butterscotch chips where I am (Greece) but I'm sure I could improvise with more white chocolate! It sounds like an incredible combination of flavours, as you say! All white chocolate would be delicious! Thanks. I have never had this flavor combination! This is so perfect because I adore butterscotch and my fiance loves peanut butter. Totally making this! It really is a great combo! Thanks. I've made a couple of Trisha's recipes and they taste as good as they look. 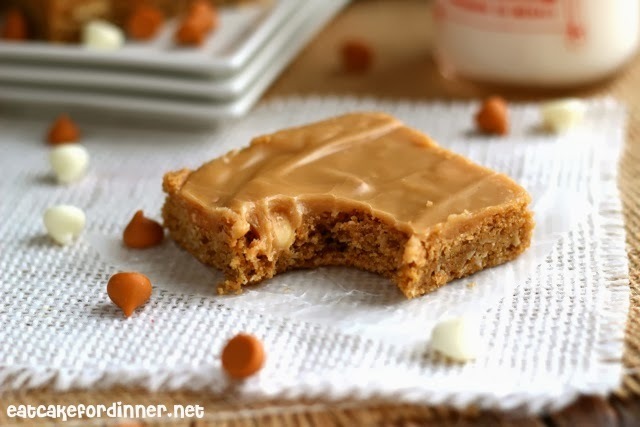 These look super yummy and you can't go wrong with peanut butter! Good to know - I will have to try out some more of her recipes. Thanks. I am all over these. PB + Butterscotch is one of the best combos EVER. These are so perfect! I just made these bars. I couldn't wait to let them cool before I tried a small bite. Dang girls, these are mighty good. I had to cook my bars longer than 20 minutes in my oven. Holy smokes these things are delicious! What kind of salad dressing was it . . . like a ranch or Italian? I hope you have enough butterscotch chips to make them too!! Butterscotch and peanut butter are totally made for each other. These bars look heavenly! Pinned! This looks delicious. I was wondering if there's something I could substitute for the oats or omit them altogether? Thank you!